Ultimately, Phil Mickelson walked away with the $9 million purse, but not before some laughs, awkwardness, technical difficulties, heavy breathing, and oh yeah, golf. 1. The golf itself wasn't great. Tiger was lippin' putts all over the place and struggled to keep the ball in the fairway. Phil struggled with the bunkers. Make no mistake: Tiger and Phil ARE all-time greats, but even with extra holes, it didn't look like two golfers in their prime competing for money and huge bragging rights, it looked like two fading stars trying to find some semblance of greatness again. 2. The on-course mic talk was awkward. At one point, Tiger, Phil, both their caddies, and the announcers were all talking at once. And the chatter was as dry as a bad Thanksgiving turkey. I don't know what we expected - golfers don't talk much during play, except to their caddies about their next shot. Also, Phil's heavy breathing had people worried about his cardiovascular health. 3. The side bets were "meh". Tiger and Phil were allowed to make bets on the holes: who would birdie, closest-to-the-pin, etc., with the money going to charity. Cool! Except the PGA Tour completely sucked the fun out of it. 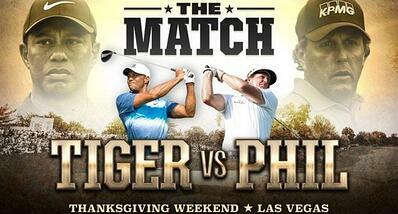 They limited Tiger and Phil to only 4 side bets, totaling $800,000. Which makes no sense, right? This is a non-PGA Tour sanctioned event, and they made sure to say as much in the weeks before the event. Why, then, did they get to dictate the amount and number of bets? Lame! 4. The broadcast was full of technical difficulties. Some people who tried to watch the match online at Bleacher Report were not able to pay due to an issue with the paywall page. To remedy, they took the paywall down and offered the match for free - but not before many people had already paid $19.99 (or more, for high definition). As a result, Turner (who owns Bleacher Report) will be giving refunds, and many other cable companies are doing the same. So basically, the entire PPV thing was useless and stupid and it should have just been a normal broadcast match. Got it. 5. 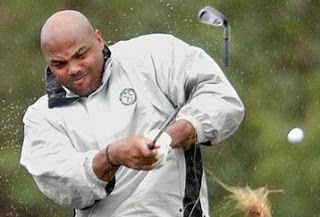 Charles Barkley is a national treasure. "You know America, you’re watching some really crappy golf," was one of Chuck's remarks during the broadcast. He also had hilarious banter with Samuel L. Jackson, who is also a gem. The Capital One commercials spliced in between holes were far and away the best part of "The Match". Also - we may have another "The Match", as Charles took pitcher Justin Verlander up on a bet. If Chuck gets double bogey or better on the first hole, Verlander will donate $100k to charity. All in all, it was still golf in November, and it was a fun thing to watch with my dad and grandpa and boyfriend while having a few glasses of wine. I'll give it 4/10. So, did you watch "The Match"? What did you think of it? Did you have a turkey leftovers nap instead? Let us know below!